If you are looking for a cozy, beach hotel in Atlantic Beach, with the best views of the Atlantic Ocean, we are the perfect location on the island, with easy access to Morehead City, historic Beaufort, Emerald Isle and Fort Macon. Steeped in history, we offer 38 rooms with a beautiful oceanfront view, and a nostalgic feel of a “home away from home”. The Seahawk hotel rooms are non-smoking and have refrigerators, coffee makers, balcony or patio, and WiFi extends all over the property, as well as in all the rooms. In addition, we have designated pet friendly rooms with a daily $15 fee. Gas grilling area, beach bikes, hammocks and swings at the dunes, oceanfront pool…all complimentary to our guests! The Seahawk also offers two large Villas accommodating up to 12 people, not pet friendly, overlooking the ocean. These two story properties host a “beachy” feel with the comfort of all amenities such as a full dining and living quarters, three full baths and three large bedrooms. The Villas are available on a weekly basis in season and for a minimal stay in the off season. A cottage is also available for accommodations up to four people, pet friendly, with a full kitchen, dining area and two bedrooms adjoined by a full bathroom. 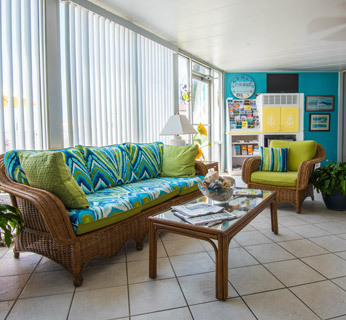 Come stay at the “Seahawk” and create great memories from your favorite place to be in Atlantic Beach! Must be 25 years or older to make a reservation.